Massive workplace raids are part of a pressure campaign for guest-worker programs. 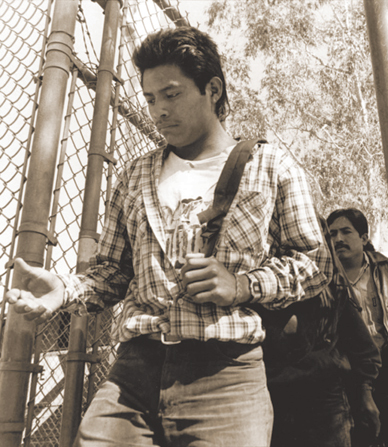 DAVID BACON An undocumented worker is deported at the Mexicali border crossing. A special Federal District court convenes every day at 1 pm in Tucson. All the benches, even the jury box, are filled with young people whose brown skin, black hair and indigenous features are common in a hundred tiny towns in Oaxaca or Guatemala. Their jeans, T-shirts and cheap tennis shoes show the dirt and wear from the long trek through northern Mexico, three days walking across the desert, and nights sleeping at the immigration detention center on the Davis-Monthan Air Force Base. Leaving the courtroom a young woman stumbles, eyes streaked with tears. A public defender tells the judge her feet are covered with blisters from walking through the wilderness. A boy no older than 13 or 14 searches the room with his eyes as he’s led away, perhaps seeking a friend or relative. No one seems older than 30, and most are much younger. They are today’s border crossers–the mostly indigenous youth of southern Mexico and Central America. They all plead guilty to a federal criminal charge. Sentences run from time served to six months in a federal lockup run by Corrections Corporation of America (CCA). According to the Spanish news agency EFE, this new court process, dubbed Operation Streamline, convicted 5,187 migrants between January 14 and June 10. Isabel Garcia, who heads Derechos Humanos, a leading immigrants’ rights organization in southern Arizona, says the current daily quota of seventy chained defendants will soon be raised to 100–fifty tried on one shift, fifty on another. Twenty-one new federal prosecutors will handle the surge, with CCA detention facilities to house it. A new bureaucracy is growing rapidly, thanks to drastic changes in immigration law enforcement. In past decades, migrants were treated very differently when caught without papers. They were allowed to leave voluntarily or were deported after being found guilty of an administrative infraction, the equivalent of a parking ticket. Today’s migrants are being treated as criminals. The features pioneered in Tucson’s courtroom–serious federal criminal charges, mass trials of defendants in chains and incarceration–are becoming standard features of immigration raids from Postville, Iowa, to Los Angeles. State laws supplement federal statutes, and federal, state and local authorities cooperate closely to bring a large variety of criminal charges against migrants. The vast increase in workplace raids has gone hand in hand with a pressure campaign designed to win passage of an immigration reform package centered on guest-worker programs. In December 2006, 1,282 workers were detained by hundreds of heavily armed Immigration and Customs Enforcement (ICE) agents in military garb at six Swift packinghouses. Homeland Security Secretary Michael Chertoff told reporters that raids would show Congress the need for “stronger border security, effective interior enforcement and a temporary-worker program.” President Bush wants, Chertoff said, “a program that would allow businesses that need foreign workers, because they can’t otherwise satisfy their labor needs, to be able to get those workers in a regulated program.” In July Chertoff explained to the New York Times, “We are not going to be able to satisfy the American people on a legal temporary-worker program until they are convinced that we will have a stick as well as a carrot.” His carrot is the prospect of massive contract labor programs for business. The sticks are the chains in the Tucson courtroom. Garcia’s statements have made her a target of right-wing talk-radio hosts, who routinely urge listeners to call the county executive to get her fired from her job as a public defender. But her warnings proved prescient in Postville, where Tucson’s assembly-line justice was transplanted virtually intact. On May 12 ICE agents swooped down on workers at the Agriprocessors meatpacking plant. Twenty minutes after the shift started, Maria Rosala Mejia Marroquin saw people running past the line where she stood cutting chicken breasts, shouting that la migra was in the plant. She ran too and tried to squeeze between huge boxes in a dark warehouse. “Men came in with flashlights. One pointed a gun in my face, shouting, ‘No one will escape! '” she remembered. When she was interrogated, she told agents she had a daughter in childcare but lied to keep them from knowing where the baby sitter lived, fearing she’d be picked up as well. Agents finally strapped an electronic monitoring device onto her ankle, telling her she had to wait for a hearing. Her brother Luz Eduardo was taken with 388 others to the National Cattle Congress, a livestock showground in Waterloo, two hours away. In a makeshift courtroom they went before a judge who’d helped prosecutors design Tucson-style plea agreements five months before the raid took place. In order to get a job at Agriprocessors, workers had given the company Social Security numbers that were either invented or belonged to someone else. The judge and prosecutor told workers they’d be charged with aggravated identity theft, which carries a two-year prison jolt, and held without bail. If they pleaded guilty to misusing a Social Security number, however, they would serve just five months and be deported immediately afterward. Workplace raids have been sweeping the country. According to Secretary Chertoff, “arrests in worksite cases have jumped from a total of 850 in 2004 to 4,940 last year, including 863 arrests based on criminal charges.” From January 1 to May 31 alone, ICE arrested 3,000 people for immigration violations and 875 more on criminal charges. On August 25 ICE agents raided a Howard Industries plant in Laurel, Mississippi, sending 481 workers to a privately run detention center in Jena, Louisiana, and releasing 106 women for “humanitarian reasons,” most in ankle bracelets. While workers taken to Jena weren’t hustled before a judge, as they had been in Postville, a week after the raid they were still incarcerated, many with no idea where they were being held. ICE spokeswoman Barbara Gonzalez declined to say how much longer detention would last. Federal prosecutors charged eight with felony identity theft, and Gonzalez said criminal charges might be brought against the others. Patricia Ice of the Mississippi Immigrants’ Rights Alliance (MIRA) called the raid political. “They want a mass exodus of immigrants out of the state, the kind we’ve seen in Arizona and Oklahoma,” she declared. “The political establishment here is threatened by Mississippi’s changing demographics and what the electorate might look like in twenty years.” In the past two decades, the percentage of African-Americans in the state’s population has stabilized at more than 35 percent. Immigrants, who were statistically insignificant until recently, are expected to reach 10 percent in the next decade. Jim Evans, state AFL-CIO staffer, leader of the legislature’s Black Caucus and MIRA board chair, says the state sanctions law (which makes it a felony for someone without papers to hold a job) and the raid serve the same objective. “They are both efforts to drive a wedge between immigrants, African-Americans, white people and unions–all those who want political change here.” At the same time, he says, “they make it easier to exploit workers. The people who profit from Mississippi’s low-wage system want to keep it the way it is.” He points to the fact that while workers without papers now risk fines, prison time and deportation, Mississippi employers have hired thousands of guest workers. Two weeks before the Mississippi raid, Chertoff made the same connection. “There’s obviously a straightforward solution to the problem of illegal work,” he said, “which is, you open the front door and you shut the back door…. Congress wasn’t willing to open the front door…. In the interim, to be honest, we’re closing the back door…. I think it’s a necessary condition to satisfy the American people that when the front door is opened, we will really bring people only through the front door.” Closing the back door is a euphemism for immigration raids. Opening the front door means guest-worker programs. The group, headed by the US Chamber of Commerce, includes the American Meat Institute, the National Association of Chain Drug Stores (Wal-Mart is a member), the National Council of Chain Restaurants and other industry associations–which are major campaign contributors (in the 2000 election cycle, the meat-processing industry gave $145,500 to Democrats and $1.14 million to Republicans; so far this year, the restaurant industry has given $2.9 million to Democrats and $4.4 million to Republicans). EWIC’s ideas were embraced by most Democrats as well as Republicans, who dismissed as “politically unrealistic” an immigration bill sponsored by Representative Sheila Jackson Lee and members of the Congressional Black Caucus that did not contain a guest-worker program. Meanwhile, John Gay, representing the National Restaurant Association at EWIC, became board chair of the National Immigration Forum, a powerful immigrant-advocacy group in Washington. EWIC anchored a coalition with immigration lawyers, establishment civil rights organizations and several unions pushing for a reform package. And Tamar Jacoby, former staffer at the right-wing Manhattan Institute, organized a new corporate lobbying group, ImmigrationWorks USA, that includes EWIC, the National Council of La Raza, the National Restaurant Association and the US Chamber of Commerce. The immigration reform bills introduced into Congress from 2005 onward, with crucial input from EWIC, linked guest-worker programs to heavy enforcement. Labor contractors would be allowed to recruit hundreds of thousands of workers a year outside the country, on temporary visas that would force them to leave if they became unemployed. The bills then mandated a tighter border to make crossing without papers more difficult, while beefed-up employer sanctions would make it impossible to work without a guest-worker visa. “Enforcement is not an issue you can separate from guest-worker programs,” says Mary Bauer, director of the Immigrant Justice Project at the Southern Poverty Law Center. An SPLC report, Close to Slavery, documents extensive abuse of workers in current programs and the benefit to employers of a workforce with few rights, whose vulnerable status makes organizing to raise wages difficult. “Immigration enforcement is structurally necessary for these programs,” she explains. Most comprehensive bills contained legalization provisions for undocumented people but would have imposed fines and waiting periods from eleven to eighteen years, during which applicants would have a status similar to guest workers. With Chertoff citing Congress’s failure to pass Bush’s reform package, the administration began to implement its enforcement proposals through increased raids. “We would have had raids with those bills too, because of their enforcement and funding provisions,” says Marielena Hincapié, director of programs at the National Immigration Law Center (NILC). Many supporters of tougher immigration enforcement claim that they have the interests of workers–both foreign-born and American–at heart. ICE asserts that raids and sanctions are intended to prevent employers from exploiting vulnerable undocumented workers. A week after the Postville raid, Myers said the ICE raids targeted “unscrupulous criminals who use illegal workers to cut costs and gain a competitive advantage.” But in reality, very little is being done to enforce labor standards. On July 15 the Government Accountability Office charged that Labor Department inspectors routinely fail to investigate complaints and close half of them after short calls to employers. Between 1997 and 2007, the number of inspectors dropped from 942 to 732, and the number of cases went from 47,000 to 30,000, the lowest since World War II. Meanwhile, the budget for the Border Patrol has climbed to $3.5 billion, and its 15,000 employees make ICE the second-largest investigative government agency. The current enforcement campaign is geared toward punishing workers, not employers. The affidavit supporting ICE’s search warrant for the Postville plant stated that a source saw a supervisor “duct-tape the eyes of an undocumented Guatemalan worker shut and hit the Guatemalan with a meat hook,” but the worker did not want to report the incident because “it would not do any good and could jeopardize his job.” Although ICE would not identify the beaten worker or confirm his detention, it is probable that after the raid he was in federal prison, while the supervisor continued working, since none were taken to Waterloo. The Iowa Labor Commissioner documented fifty-seven cases of child labor at Agriprocessors and filed charges of numerous violations against the company. Although some workers may get temporary visas as witnesses, all will eventually be deported. Not only do these tactics fail to protect labor standards; they often aid employers in resisting efforts by undocumented workers to improve their conditions. During a union-organizing drive at Smithfield’s Tar Heel, North Carolina, packinghouse, two raids created a climate of fear, according to organizers. And when housekeepers at the Woodfin Suites in Emeryville, California, tried to enforce a new municipal living-wage law, ICE investigated them at the request of Republican Congressman Brian Bilbray and company president Samuel Hardage. A year before the raid in Postville, supervisors often used immigration status to threaten workers involved in a union drive at Agriprocessors, according to Mejia. ICE has enlisted state and local authorities in its campaign to criminalize work. Last year Arizona passed bills requiring state employers to use the E-Verify system to ensure they were not hiring the undocumented. Employers must verify an applicant’s immigration status with a database, which DHS said in 2007 “is still not sufficiently up-to-date to meet the…requirements for accurate verification.” The original bill would have punished any employer with an undocumented employee, but after employers protested, the law was changed so that they would be fined only for future hiring. In March, Arizona state police arrested eleven employees at a Tucson Panda Express restaurant for mismatched Social Security numbers. After the state prosecutor threatened felony identity theft charges, carrying long prison sentences, workers pleaded guilty to lesser charges and were sentenced to time served. Nevertheless, in August, two were still in jail, five months after the raid. As in Postville, deportation became a desirable outcome. Francisco Mondaca, who pleaded guilty to “impersonating a Panda worker,” says, “I didn’t hurt anyone. I filed W-2s and paid taxes. All I did was go to work.” After the raid, Panda Express fired all its Arizona workers, according to one terminated employee, and brought in a new workforce. “The company knew we didn’t have papers,” he said. “Managers would talk about it.” No action was taken against management. On March 17 Mississippi Governor Haley Barbour signed SB 2988, which requires employers to use E-Verify and gives them immunity for hiring undocumented workers if they do. An undocumented worker, by contrast, faces felony charges carrying one to five years in prison and fines up to $10,000 for holding a job. Workers are ineligible for bail. At roadblocks near local chicken plants in Laurel, Mississippi, “They take us away in handcuffs and we have to pay over $1,000 to get out of jail and get our cars back,” according to one worker, who asked that her name be withheld. In California, the AFL-CIO, two central labor councils and one building trades council, the NILC and the ACLU filed suit in 2007 to stop ICE from issuing a new regulation, under which Social Security would have sent letters to more than 140,000 employers, listing the names of at least 8 million workers with mismatched numbers. Employers would have had to fire all who could not produce verifiable Social Security numbers. The order was blocked by US District Judge Maxine Chesney and remains on hold. Just three days after the Mississippi raid, while many immigrants hid in their homes in fear, MIRA organizer Vicky Cintra and more than a hundred raid victims and family members marched down to the Howard Industries plant to demand withheld paychecks. When company managers called the police, who tried to arrest Cintra, immigrants began shouting, “Let her go!” As news reporters arrived on the scene, the police backed off. Seventy families got paychecks to keep them eating while their men were in immigration jail and their women were braceleted and unable to work. Implementing its program by executive action, the administration has created a large bureaucracy, with rich contracts and high-paying jobs, to carry out the raids. Any new administration will thus inherit an entrenched program that enjoys considerable political momentum. Should John McCain be elected president, he is likely to embrace that program and continue the quest in Congress to weld the system developed under Bush into place. McCain co-sponsored the Kennedy-McCain bill, helping to set the terms for Washington’s immigration debate. As Arizona senator he belongs to the establishment that made the state an enforcement testing ground. Barack Obama has the chance to stop this juggernaut. At the AFL-CIO, Ana Avendaño, director of immigration programs, is drafting ideas for an Obama administration’s first 100 days. “At the very least, it could change the regulations and terms of enforcement,” she says, ending, for instance, the practice of charging undocumented immigrants with federal crimes like identity theft. The larger question, however, is whether Obama would challenge the mushrooming enforcement bureaucracy and the raids it feeds on, and advocate a more humane system. Organizations like the National Network for Immigrant and Refugee Rights urge that instead of the enforcement/guest worker/legalization triad, Congress should legalize people without papers and make more visas available for legal migration, without setting up guest-worker programs. The AFL-CIO, the network and many others want much greater enforcement of labor standards and union rights, and call for repealing employer sanctions. Instead of reinforcing the unequal status of millions of immigrants, or treating them as a cheap labor supply for corporate employers, immigration policy can and should protect the rights and living standards of immigrants–and workers generally.